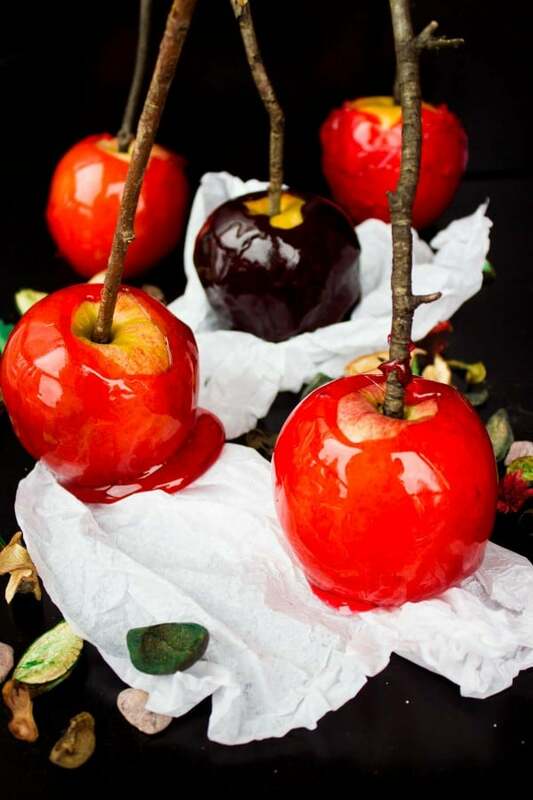 This easy candied apples recipe is a fabulous last minute Halloween treat, and any fun day treat! They are super easy, sweet, a classic and a favorite for all ages! Some sugar, water and food coloring (NO corn syrup!!) 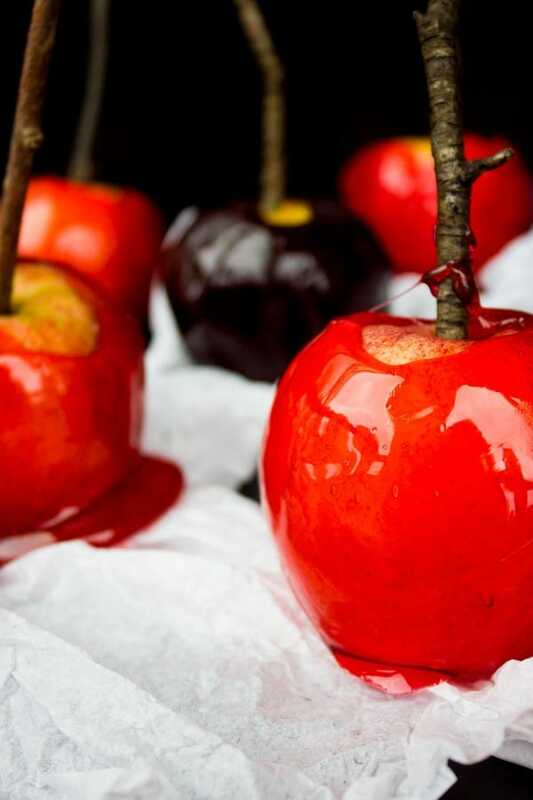 will be all the list you need for these sweet apple, and candy tasting treats. 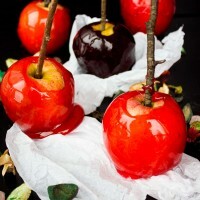 Spook it up with a black apple like we did here for Halloween and for extra drama on who will “bite” that black apple! So even though we made those spiderweb chocolate pumpkin muffins for Halloween already and oh were they yummy! 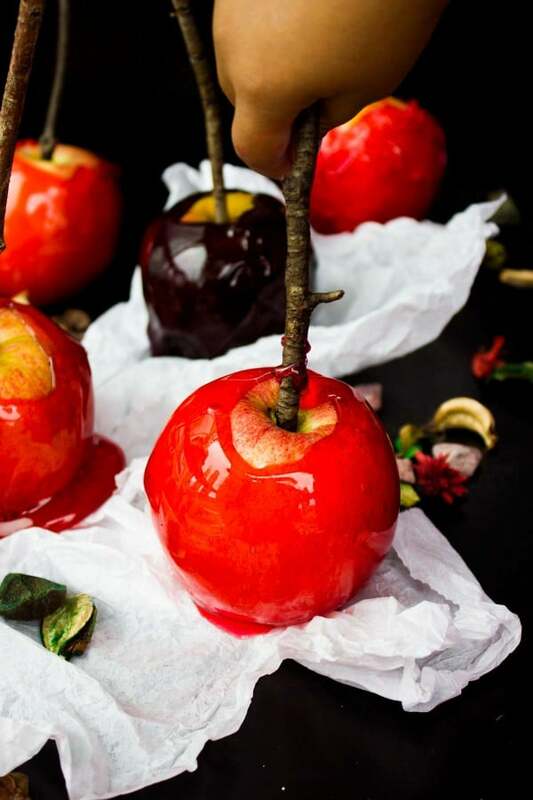 My big girl asked for those easy candied apples and she came up with the idea of a black one, it sounded too tempting for me to pass on, so here we go—another Halloween recipe! But these are really more last minute. They need just 15 mins or so of cooking and just 45 minutes for the caramel to set on the apples. Although I will admit we took a crunch off that red apple in just 25 mins! Now my favorite part of Halloween is, it’s my dad’s birthday! So Happy Birthday to the kindest, sweetest and most terrific loving dad in the world! When we were young we double celebrated, and lucky dad he always had a birthday with kids super dressed up and super excited! Even as a grown up, Halloween will always be on my mind the day we scare dad and wish him a haunted birthday! And these easy candied apples are one of his favorite treats—so it’s a double special recipe now! Halloween is my girls’ favorite time of the year too, they talk about it at least 3 months ahead and start counting the days. I can’t decide what their favorite part of it is, maybe the dressing up, the trick or treating, the candies and treats, the all day school party and all evening playdate, I can just say that for me it’s definitely the trick or treating! So this year like the last few years we are doing an “indoor” trick or treating at my friend’s building. As awkward as it sounds, it works best for us! For some reason Halloween has been dreadfully rainy and cold the last three years in a row for us, and one of those years we went trick or treating in the cold rain—OMG! Kids had to wear heavy jackets and cover their costumes but the bottom of the costumes were muddy and wet, the rain filled their trick or treat baskets and spoiled their treats and we just left 30 mins later. No more of this madness. Indoor works best for us! Now back to those easy candied apples for a minute. They are in fact easy. But they can go wrong. If they do, you won’t enjoy them! So a few things are crucial for this recipe. You’ll need a candy/oil thermometer to boil sugar and water to a perfect temperature of 300 degrees F. This is the hard crack stage of sugar. More than that, you’ll get a tooth breaking crunch. Less than that, you’ll get a sticky candy coating. None are pleasant with apples! Another thing, the coating process. So once you boil the sugar, water, food coloring till the exact temperature, you’ll need to be as fast as you can dipping the apples in the sugar mixture. This will help get a small coating only stick to the apples because a thick coating means more tooth breaking crunch—not pleasant! if you feel the sugar is hardening slightly as you are working, just heat it back on the stove for a few seconds to loosen it back again. 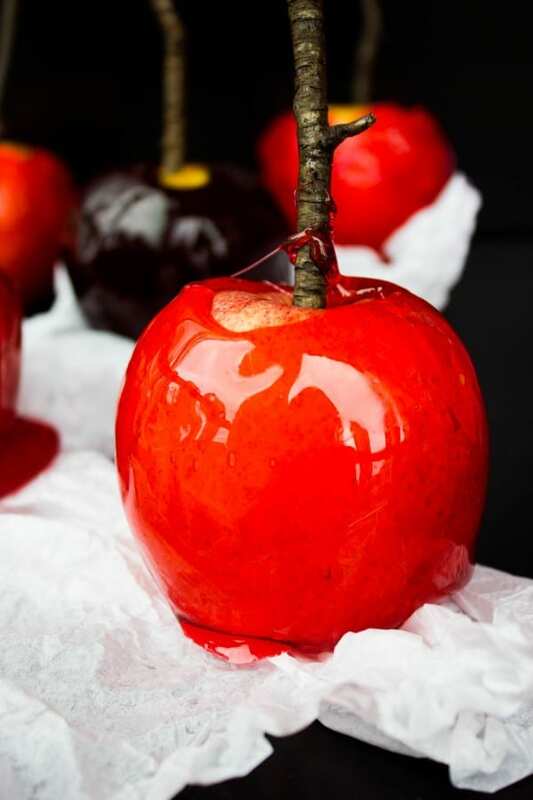 And a final tip is to drain any excess coating off the apple before drying the coating. Again, a thick coating is not good for you tooth! You want those easy candied apples to have a thin delicate crunch on the outside, not a thick hard one. You’ll notice I didn’t use corn syrup in this recipe like most other candied apples do. 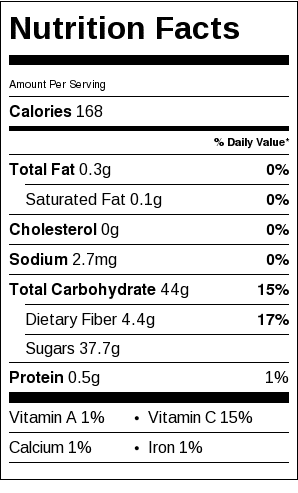 Corn syrup if you make at home is basically sugar, water and cream of tartar boiled to a soft crack stage of 250 degrees F. If you buy this from the store, chances are it contains a ton of processed stuff you don’t need! So why is it used then? Well the cream of tartar used in the corn syrup helps the caramel stay as smooth and soft as you can see. Otherwise when you boil sugar and water, the sugar tends to crystallize and your caramel may be “gritty”. Now the good news is—lemon juice or vinegar will give you the same effect and keep your caramel silky smooth from crystallization. 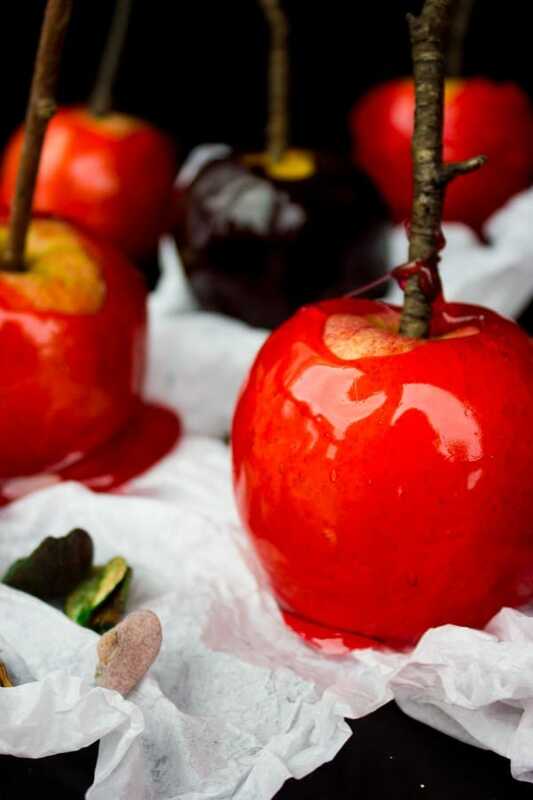 So for this easy candied apples recipe, feel free to use cream of tartar, lemon juice or vinegar and skip the syrup! One last note about the apples. Make sure you wash and dry your apples well before dripping them into the caramel. And when it comes to the type of apple, it’s completely optional and personal. I wouldn’t pick a golden delicious or macintosh apple because they’re quite sweet to start with, but I know someone like my dad would! So it’s very much a personal choice. 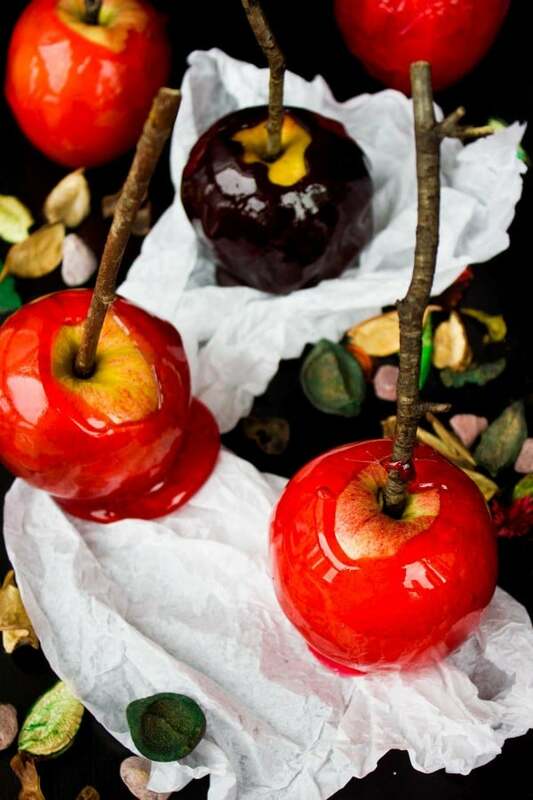 I used gala apples today—they’re my favorite type of apples in general, and even though they are a bit sweet, I love them with that thin candy coating! Wash and pat dry your apples. 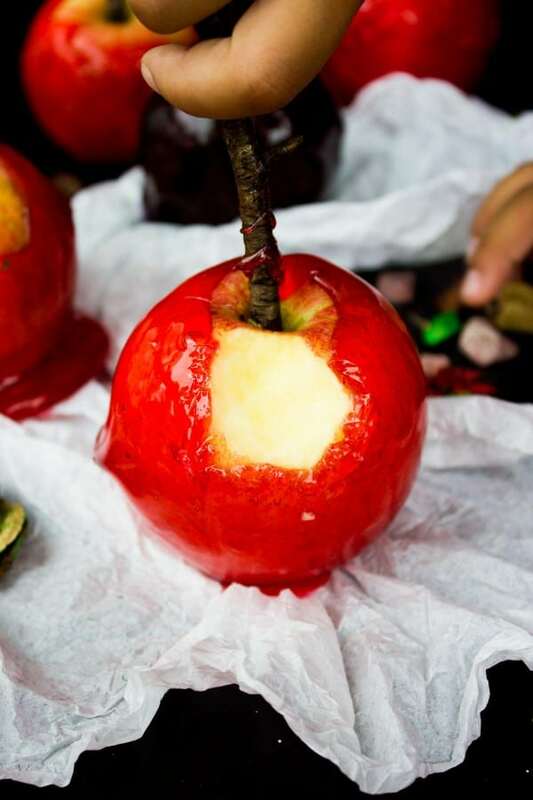 Place a wooden stick or tree stick in the middle of each apple reaching as deep as you along the length of the apple. Make sure the apple is firmly attached to that stick. 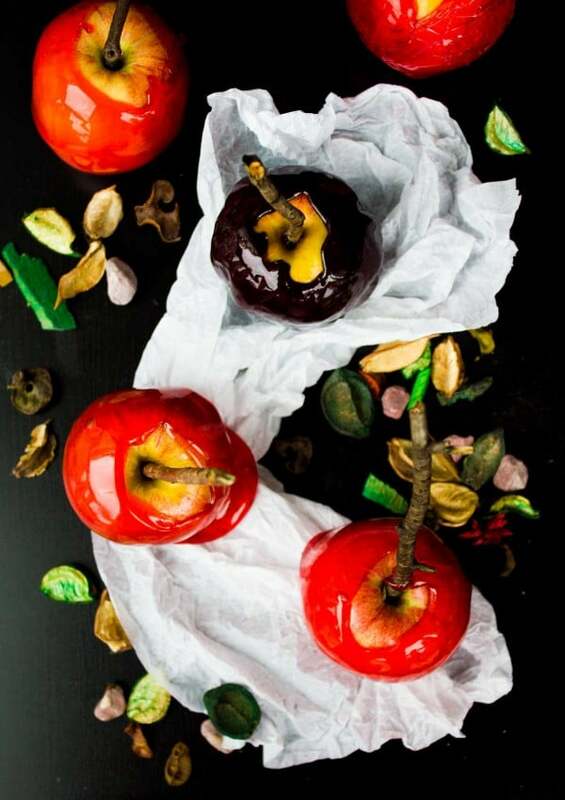 Place the apples on a parchment paper. In a medium to small pot, add the ingredients all together and place on medium high heat until it starts to boil. At that point lower the heat to medium and place a candy/oil thermometer in the pot. Allow the sugar to boil gently for approximately 12 mins until the thermometer registers hard crack stage or 300 degrees F.
Remove from the heat and immediately begin dipping the apples. Tilt the pan to make dipping easier. Dip one apple at a time swirling around the sugar mixture and hold each apple onto of the pan so that any excess sugar drops. 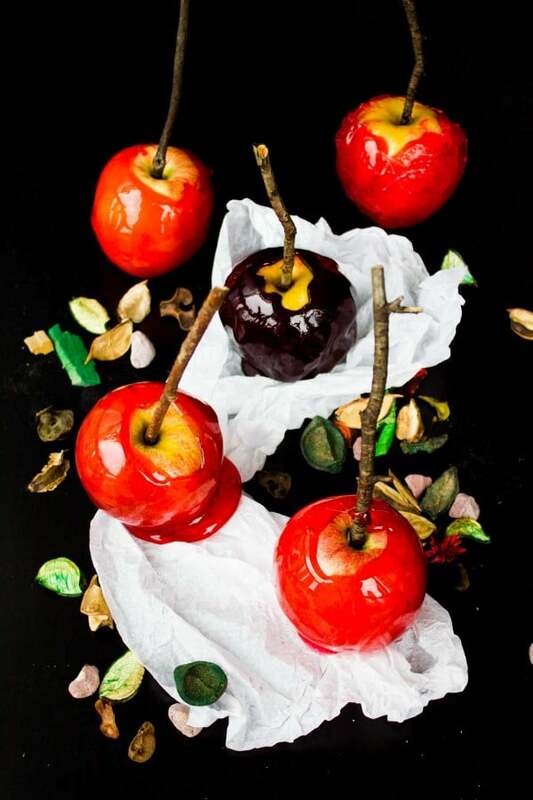 Place the cited apple on the parchment paper and repeat with the remaining apples. If the sugar mixture begins to harden or thicken up, place it back on the heat for a few seconds until it becomes runny again. Allow the apples to cool for at least 30 mins to an hour. Remove from the parchment and serve. Yes!!! Thank you so much! Exactly what I was looking for ?? Yaay Madeline! 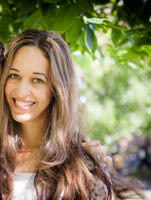 Hope you make it soon!